Patrol Service Involves Much More Than Just Driving by in a Marked Vehicle. 365 days a year, Centurion Security patrols and secures a vast number of properties all across the Wasatch Front. 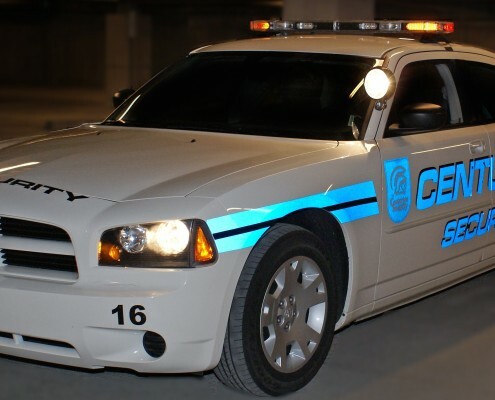 With multiple patrol cars operating each night, Centurion delivers safety, security and peace of mind to our clients. Security Concerns: We want to learn about issues you have encountered in the past and what you believe are your greatest security vulnerabilities? Patrol Schedule: Based on your security concerns and available budget, Centurion helps you determine an effective patrol schedule and the number of patrol visits you need each night. Lock and Unlock Requirements: If you want lock and unlock services, we discuss the required timing as well as key control and accountability. Foot Patrols: We determine the need for supplementing drive-by service with foot patrols, and whether such patrols are regularly scheduled or based on circumstances observed while on site. Emergency Procedures: Centurion will discuss with you the potential emergency situations that might arise at your site and agree on the proper protocol for response and notification. Reports: Every day, Centurion will provide clean, clear, electronic patrol reports that you can save and print if you wish. During the implementation process we determine precisely what information you want to receive and who your designated contact is. Accountability: Did you know that Centurion Security officers have both personal GPS tracking devices on their person and a secondary GPS tracking device on all of our fleet vehicles? This provides our customers with an accurate accountability and maximum efficiency. Communications: Centurion Security utilizes the latest in high end radio technology. Our radios are able to communicate anywhere from North Salt Lake all the way to Spanish Fork. Our officers are “on radio” with one another throughout the night as they make their patrols and secure their properties. Cost Affordable: Mobile patrol is one of the most cost effective services in the industry. It allows for a nightly security presence at your property 356 days a year. With Centurion Security working on your side, you can rest at ease that your properties are being carefully monitored. Our team will keep you updated using cutting edge GPS reporting technology. As a Centurion customer, we provide you with FREE GPS Reporting. If you aren’t receiving this service free of charge now, how do you know if you are getting a reputable service? Centurion utilizes a state of the art GPS verification system for reporting our patrol unit locations. Our clients can receive electronic notifications with time and date stamp for every patrol conducted. We can even include photographs of security and safety related issues. With Centurion Security working on your side you can rest at ease that your properties are being carefully and correctly secured. Chances are good that we can accommodate your request, however you should be aware that we do not accept all patrol requests. To keep our quality of service high, we do limit the number of clients per patrol area. Sometimes, a patrol for a certain region may be completely full or operating near capacity. If we cannot accommodate your request, we will refer you to a credible alternative. Call today to see if your property qualifies for the best mobile patrol services in Utah.